The history of cinnamon dates back to 2,800 BC where it was used for it ability to preserve meat from bacterial spoilage and as part of the embalming process. worth more than silver or gold, had wars fought over it, and was used for its medicinal properties. It has been an important trading commodity throughout the ages via the spice road of China and the spice markets in Istanbul and also helped encourage the spice traders who opened up the new world through their explorations. It was a sign of high social status in Europe to offer spice to your guests to create an air of mystery and excitement from the exotic East. Cinnamon these days is often mixed with or substituted by its' close cousin Cassia. 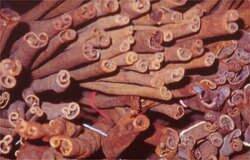 Most cinnamon is grown in Sri Lanka and the characteristic sticks are created by striping the bark from young branches. Ground cinnamon is produced from grinding the older bark. Cinnamon is used to flavour sweet and savoury dishes and is an important component of curries and the middle eastern spice mix, Baharat.